You know how we're an art family...: A new pet! 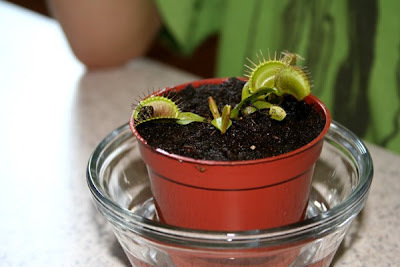 After a few months of hearing the kids beg, I broke down this weekend and bought the Venus Flytrap they had been ogling every time we set foot in Whole Foods. 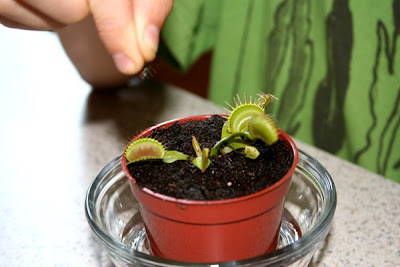 While I think it's ironic that a vegetarian family would own a carnivorous plant, I'm more than happy to accept help with the flies that seem to never leave our house. Almost immediately, Paulie and Philip set to work trying to catch a fly to feed Venus. Paulie spent nearly an hour weilding a floppy bookmark and finally knocked one unconscious. I, of course, like every good mother, made him stand there holding the unconscious fly until I could get some good shots. 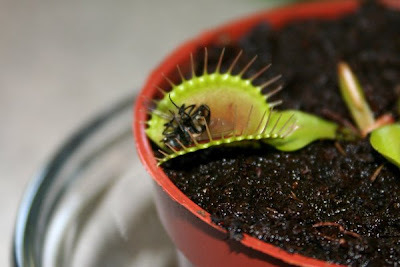 When he initially dropped the fly into Venus's trap, he dropped it just a bit too far to the side, missing her trigger hairs so we were able to get a couple of shots of the fly just hanging out in Venus's trap. I wasn't able to get a good shot of the actual trigger hairs, called cilia, but you can see them on Wikipedia. I pulled out a butter knife and barely tapped the fly to move it closer to the cilia, and before I could even reposition the camera, Venus's trap was closed! 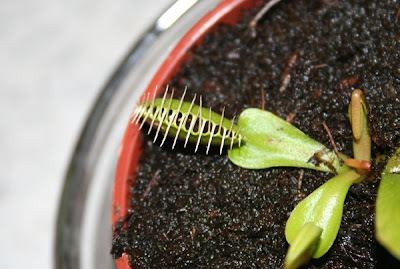 From the side of the plant, in the right light, you can even see the shadow of the fly in the trap. Wow absolutely amazing photos Joy! I think we should get one of those little plants here for summer. Now that is summer fun at it's best! Those pictures are great! We had one and loved it! The trick is to keep it very, very humid. But I think you're in NC where they're native, aren't you? That shouldn't be a problem! Um... tiny slugs can be processed in a few hours. kooky.